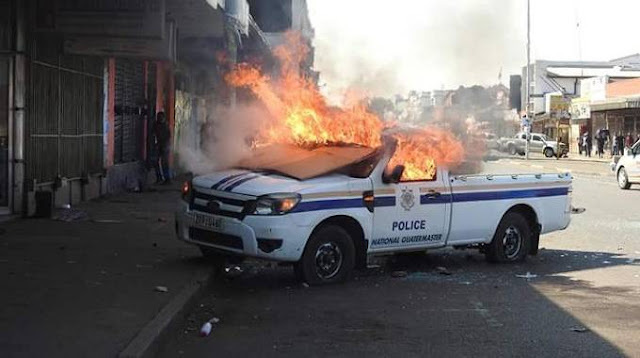 THE MDC Alliance and its allies in non-governmental organisations and civil society sectors are behind the violence that broke out is some parts of the country yesterday, leading to a loss of life and destruction of property, including burning of buses and police vehicles, Government has said. In a statement last night, Minister of State for National Security Owen Ncube said the State had activated all its security organs. By last night over 200 unruly elements had been arrested in connection with the violence, which by all looks was planned and co-ordinated through social media. “The prevailing security situation in the country is a culmination of a well orchestrated series of events by the MDC Alliance working in cahoots with NGOs, civic society, youth organisations, pressure groups and individuals,” said Minister Ncube. Minister Ncube said Government was aware of meetings organised by the Crisis Coalition in Zimbabwe from December 3 to 7 last year to foment disturbances in the country. “These meetings were coordinated by Crisis Coalition and some identified foreign agents,” he said. “There were other meetings such as the one held on 11th January 2019 in Belvedere, whose agenda was to plan for the disturbance of peace and render the country ungovernable,” he said. Minister Ncube said yesterday’s events were instructive in two ways. “They come against the background where His Excellency the President Cde Mnangagwa is out of the country and they are intended to undermine (kudira jecha) the ongoing re-engagement efforts of the President to market Zimbabwe at high level fora such as the World Economic Forum in Davos, Switzerland,” he said. “The events of the past 24 hours have been characterised by a well-coordinated criminal behaviour, destructive and violent pattern which included the barricading of roads, harassment of innocent members of the public, burning of cars, disruption of children’s lessons in schools, forced closure of business entities, attempts to overrun police posts, destruction of property, unlawful possession and discharging of firearms in public, attacking tollgates and robbing them of cash as well as looting of shops,” said Minister Ncube. Minister Ncube said Government had activated all security organs to restore law and order and protect life and property. “Government is appealing to members of the public to cooperate with the security institutions,” he said. “Government is aware of the ring leaders, their modus operandi and their funders,” he said. “Our security arms are now firmly on the ground tracking the criminals. They will be apprehended to face the full wrath of the law. In the meantime, security forces have arrested more than 200 individuals who were involved in these disturbances.